One of the great things about living in this area is that there are a ton of great shops, antique malls, and vintage markets. Fall and Christmas Open Houses are the highlight of the year as the shops go all out with great seasonal displays and merchandise. My sis and I made it to several shops yesterday for the annual event, and I have to admit, when I got home I had a case of Christmas decorating fever. 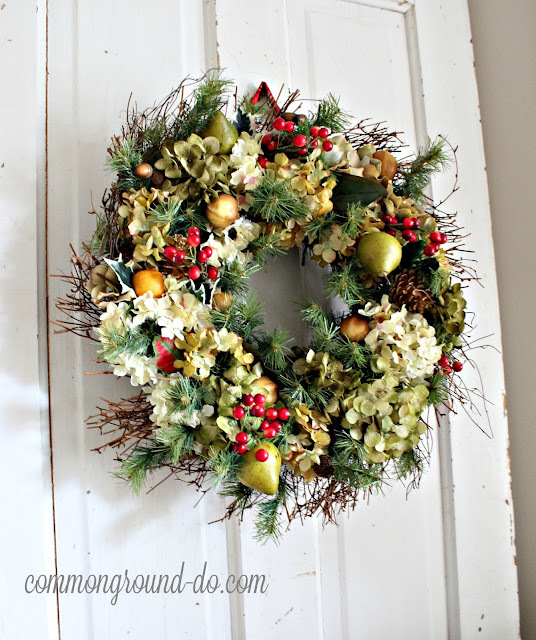 Last week, I was looking over some of my Christmas decor boxes trying to see what I had as far as wreaths go. I knew what I wanted and didn't think I had anything that would work. After buying the new one that I remade this Fall, I was prepared to try to find one on the Internet to order, or start looking at stores here in the area. Either way I knew it would be pricey. I knew I wanted to keep the same concept of a twiggy wreath with some greenery, seasonal fruit, and Hydrangeas. Yes, I love them, (Hydrangeas) and use them every season of the year! Digging through boxes and tubs, I located this wreath that I've had for years, not really sure how many. Where did it come from... did I make it, or Frankenstein it together like I've been known to do? Some of my decor purchases have now escaped my memory. I used to be able to tell you when and where I bought every piece of junk that I have, but now I can't. But I've had it awhile. I have a bad habit of DIYing spur of the moment, which often causes iffy craft work to occur on my kitchen table. Let's just say it's not good for the painted finish on my kitchen tables; they tend to take a beating. But the mood to makeover grabbed me and I had to go with it. I like Poinsettias, but in this case I was ready for something different, so the first thing I did was rip those off and do an appraisal. I felt like clumping some faux Hydrangeas into the spaces where the Poinsettias had been could work. I gathered my stash of "extra" Hydrangeas and began to snip them apart to form smaller blooms and then just hot glued them into place. Faux Hydrangeas come in such a wonderful hues that you can make them work for any season or holiday. I used a variety and tried to balance out the color. I put the wreath back into the garage "staging area" for Christmas, content that I now didn't have to spend money on a new wreath. But that's another story as I'll share soon. The deal is, that after the Christmas Open Houses, I have now speeded up the process for a "Transitional Christmas". I've made it this far today; changing out the look on the settee in the Kitchen Sitting Area with pillows and one of my woolly stadium/throw blankets... and making a huge mess. 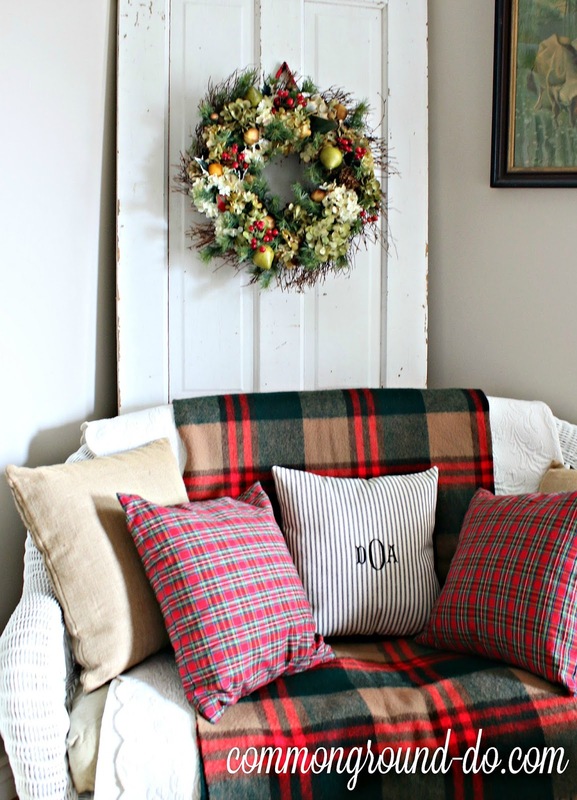 I try to do something different each year, even if it's just minor changes, so I'm using a Fall/Christmas look blanket to get past Thanksgiving. Oh, and I am "de-orange-ing" the floral arrangements and other vintage decor pieces. I love orange, but by November I've usually had my fill. I still have some white and neutral pumpkins out that will be an easy change-up after Thanksgiving. Seeing these pics, I'm already realizing I need a little something extra on the door behind the wreath; maybe a vintage picture frame or something. My house looks like a floral shop threw up Fall and Christmas here. I always have great plans to be organized during my changeover from Fall to the Holidays, but I never can quite get there. I am having fun and enjoying a little creativity even if it's super messy. I'm not totally ignoring Thanksgiving, but I'm changing up what I can without going full on Christmas. 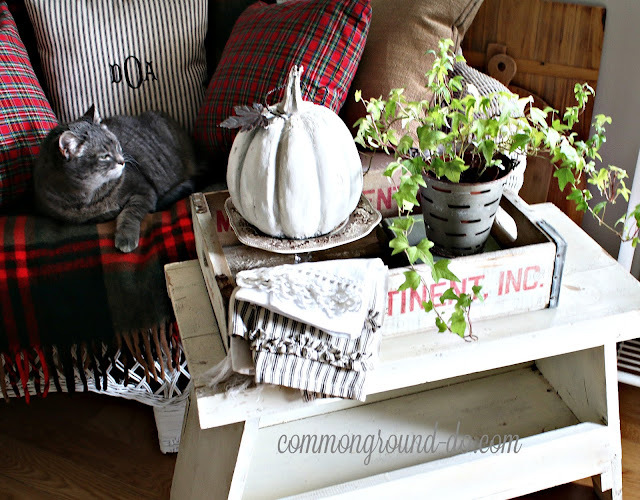 (I have some pics for a Thanksgiving Home Tour, that I'll share next week) I always feel better when I can get a little jump on decorating. So, what are you all up to this weekend? Relaxing or making a mess? 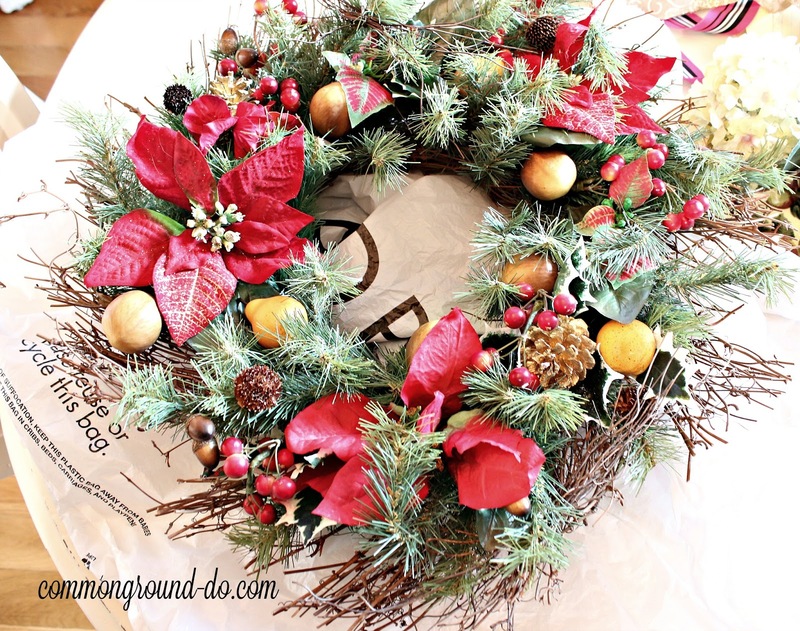 You did a fine job "Frankensteining" your wreath - love that you have such a perfect Christmas wreath and didn't go out and buy a new one or spend any extra, having all you needed to pull that all together. Well done, Deb, looks awesome! I would say that you did a terrific job on your wreath. I have decided to go a little differently this Christmas/ Since I am 82 and can no longer do all the decorating that I used to do, or put the stuff away after Christmas. I like everything thing that you have done so far - looks great. Super job on the wreath! I envy your talent and those of you that can create something out of a simple grapevine or metal base. Egad! I'm a lost cause! I've been looking on websites for something pretty, especially since we just landscaped, had a new porch put in, and new light sconces. How much should I pay?? Love your decorating and yes, someday I'm getting down to your area and I want a list of all of your fave places!! very, very beautiful. Have a happy week. Hugs. You've wreath turned out so pretty. I can't belief you've already got some Christmas down already. I'm staining 90 year old floors and need to put out some fall! Very pretty! 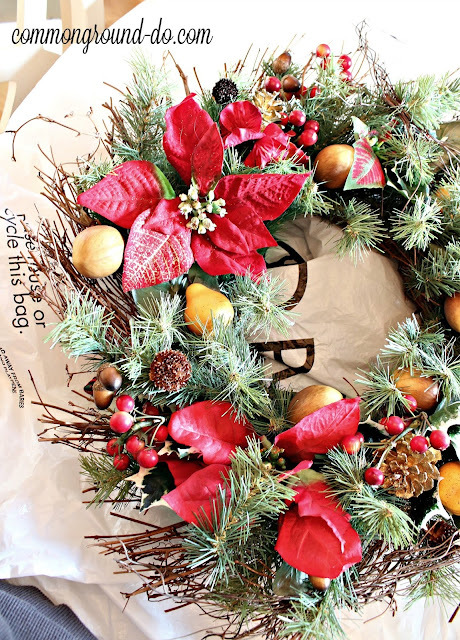 Your wreath looks wonderful! I love hydrangeas too. A friend dropped off a bag of dried to me the other day and I still haven't decided what to do with them yet. Perhaps a wreath or a centrepiece for Christmas. Have a lovely day. Your "new" wreath is fabulous. I love it on the door all by itself. And what you've done on the settee is great too. 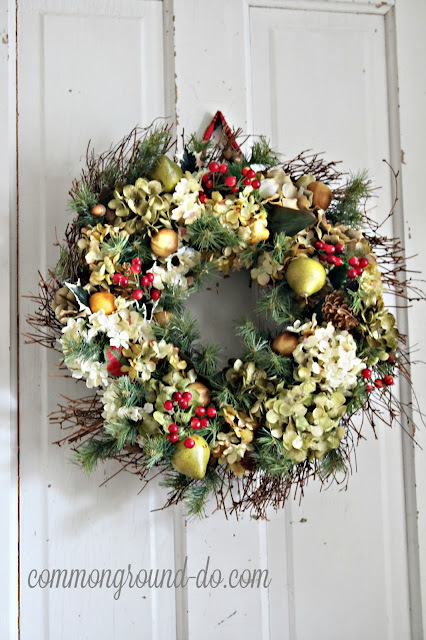 Debra, I love the transformation of your wreath! You'd never know it was the same one. Of course, I love your plaids. Started pulling mine out this week as well. It looks fabulous. I love shopping the garage, attic, or under the stairs storage. I love your plaid.